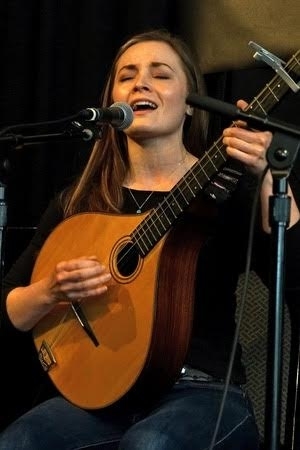 Originally from Montana, Lindsay Straw is a singer, guitarist, and Irish bouzouki player who began to explore Boston’s Irish and folk music scenes while studying film scoring at Berklee College of Music. She has impressed with her tender singing voice and an extensive repertoire that is rooted in the Scottish and Northern Irish traditions, but which also delves into contemporary songwriters like Richard Thompson and Bob Dylan. She has also drawn praise for her sensitive, agile accompaniment on bouzouki and guitar at many a local session and in concert. She has toured at home and abroad, with Boston-based band The Ivy Leaf, international trio The Morning Tree, and with Bay Area fiddler Darcy Noonan. With the help of Club Passim's 2015 Iguana Grant and a successful Kickstarter campaign, her second album of traditional songs featuring strong female characters, "The Fairest Flower of Womankind", was released in April 2017.